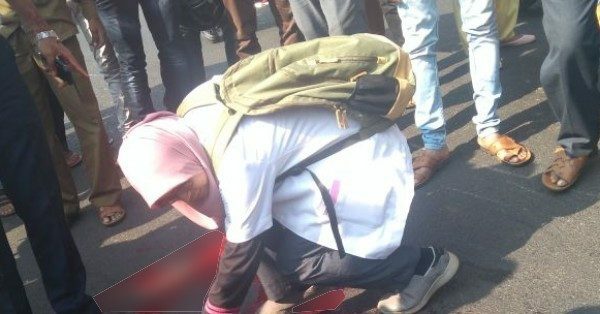 It was a normal Wednesday morning at 9.30 AM just opposite the Globe cinema Camp, a young engineer was lying on the road in blood and one hijab clad young MMBS student was trying to stop the bleeding and even tried the CPR to get life back of the injured. There were so many others who were taking pictures but Amira Natasha, a final year student of MBBS in KLE Society’s USM-KLE International Medical Programme was seen trying to help the injured. Unfortunately the injured who was riding pillion Liyano Emmanuel (24), from Bengaluru had died on the spot but the scene of a student doctor stopping and trying to help the injured is commendable. The other injured is recovering. Even when the picture was very gory we have just tried to show her as she tried to get the pulse and also tried cardiopulmonary resuscitation CPR. Amira who hails from Malaysia has won the hearts of thousands by her small act of kindness and also a lesson for others who just click photos in such scenarios to try and first help the injured, may be your timely act could save someone’s life. where r those old days , old culture when people came to help immediately for such mishap. and helf the needy. for help is the first dharma. If she had been there when my aunt had acciddent…may be she would have been saved. Hats off to her. She is incredible. Everyone must learn to help each other. She has set a perfect example. Amira great job, hats off. Many spent their time in capturing boy surrendering his last breath. Its nice to hear what Amira did although really sad for the young boy who lost his life. This revives my faith in humanity. I have never heard of a doctor forward and help and she is just a student. She is incredible. We Indians need to instill such great values within us. Ppl like her make the world worth living. You deserve all appreciation. May Allah make you a great human Doctor. msha allah this is real literacy. and true act of humanity. We need more People like her in the society. Hats off and abig salute to her….she has made the passersby hung their heads in shame..